The Entrepreneurial Leadership Awards is the Métis Nation of Alberta Region 3’s way to recognize that leadership is critical. The awards have been running since 1998 and are an acknowledgement of businesses, organizations and individuals, who have succeeded and made contributions to the Métis community. At the 12th annual gala affair, held April 16 at Calgary’s Coast Plaza Hotel, Region 3 paid tribute to nine such contributors. “It’s to honour the Métis businesses in our region,” said Marlene Lanz, the awards show organizer. “We really like to showcase them.” Members of the community can nominate the businesses, which are chosen according to a varied set of criteria, especially in the areas of business performance and community involvement. Lanz said the spinoffs of winning are more than receiving the award, a photo op and a great dinner. “Those who have won have certainly benefited, because they can put that into their portfolios and on their websites,” she said. “I know a few of them who won and discovered business had really picked up for them.” Matthew Kinderwater, owner of Calgary computer company iCube Development, won in the Entrepreneurial Leadership Male category. “It feels nice and it’s always great to be recognized for effort that you put into something,” said Kinderwater, who started the company out of a closet in 2005, while working as an IT employee at a Staples retailer. “We are a small company and as such we have to compete with big business, so any award that can bring in business is a good thing. Awards to small businesses mean a lot. For big business, not so much.” Linda Newsome, who has run Linda’s Hair in Cremona for 38 years, believes longevity has been the key to her success and winning the Entrepreneurial Award in the female classification. “It only goes to shows what people can do if they stick with it,” she said. “I go all the way back to the days when there were no curling irons. Luckily, no computers can do hair, at least not now.” Lynette Colvin took home the “In Recognition of Your Success in the Corporate World” award for her extensive service as a branch manager at BMO for 25 years. She held that post at offices in the Tsuu T’ina and Siksika First Nations before leaving as a result of illness. 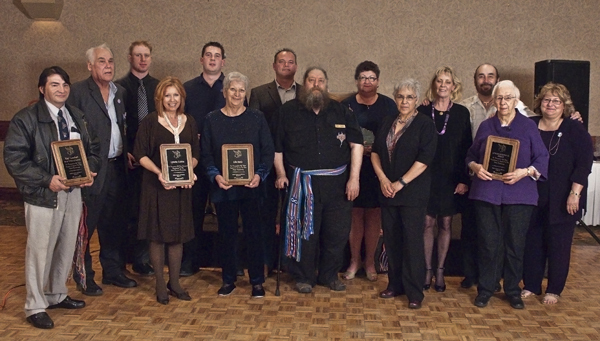 Tim Brabant, of Calgary-based Skyline Concrete Services Ltd., artist Ray Lambert (renowned for his moose horn carvings that have sold well across the continent), and Lethbridge caterer and registered nurse Edna Banks shared the “In Recognition of Your Success and Contribution to the Métis Business Community” distinction. Calgary energy company Nexen, which launched its ReachOut community volunteer program earlier this year, received the “In Recognition of Your Contribution and Support to the Métis Community.” Medicine Hat’s Muwasin Society of Aboriginal Services landed the “In Recognition of Your Support and Service to the Métis Community,” while Airdrie entrepreneur Kyle Bruce of Cutting Edge Hockey Ltd. won the Youth Award.